Hurricane Irma has already devastated the Caribbean islands, and will soon strike Florida. Georgia has been welcoming evacuees ahead of the storm for days now. Irma will likely head in the direction of Royston in the coming week, causing heavy rainfall, though it should have lost the worst of its power by the time it gets here. Nonetheless, in case we experience flooding, there are a few survival tips you need to know. 1. Don’t drive into flood waters. You may think your lifted F-150 can handle it, but it’s a decision that could destroy your car and endanger your life. 2. If you get stuck in flood waters, turn on your hazards lights, unlock your doors, and roll down your windows immediately. If your power shorts out, you may not get another chance. 3. If your vehicle can’t be driven, leave it behind and evacuate to high ground before calling 911. 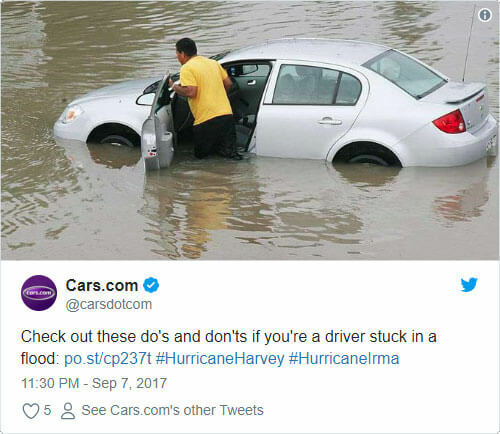 Water could still be rising, so do not wait in the car. 4. If the car is sinking, escape through the windows (doors will not open due to water pressure), helping children get out first. 5. If the windows won’t open, break them. Use a hammer or specialized glass-breaking tool if you have one, or break the window using the headrest. Be aware that the glass will rush inward with the water, so protect your eyes.